Last night our Scan 66 in white fitted by Kernow Fires was featured on George Clarkes Old House New Home. It was quite an episode and finished a series of five programmes where George Clarke took home owners through the transformation of badly renovated properties and reinstated period features in a modern style with great success! The 1930 Art Deco bungalow in Newquay had undergone the most dreadful renovations in the 70’s leading to dangerous extensions, pebble dash and almost a complete loss of the elegant house it previously was. Using images from the past George helped inspire this young family to transform the outside of the house to something resembling its former glory including beautiful curved windows and a new weather proof white render. Inside Miami art deco was the inspiration and lead to some interesting design choices in keeping with the era. Centre stage to the lounge, aside from the amazing view, was our Scan 66 in white. 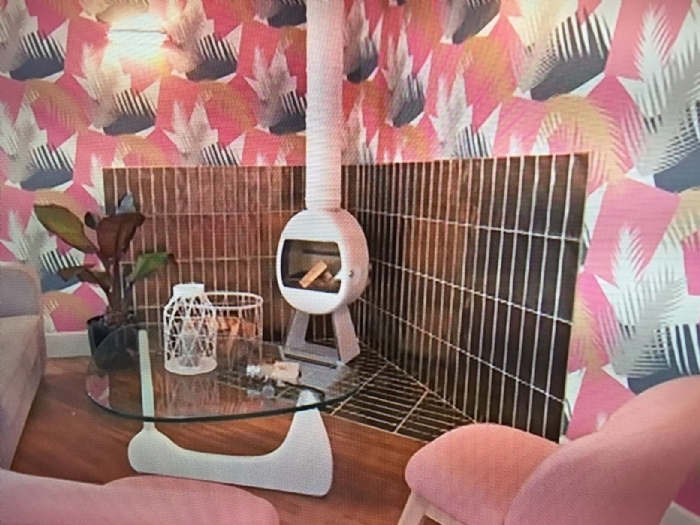 George’s team had already built the golden tiled hearth, walls and wall papered the walls in a bright pink art deco style by the time Mark, one of our HETAS engineers, and his team turned up. With the greatest of care they had to fit the flue and the fireplace into the already completed home. With the care and expertise we expect from our teams they managed the job well and the result was stunning.